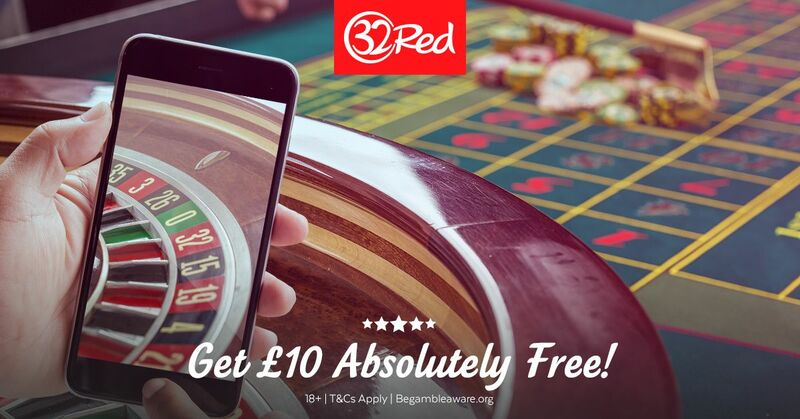 Register at 32Red Casino today through BetAndSkill and receive £10 free. No deposit, No delays, No fuss. New UK players will receive our fantastic £10 No Deposit Bonus upon sign up along with a £32 bonus for every £10 deposited on their first purchase. 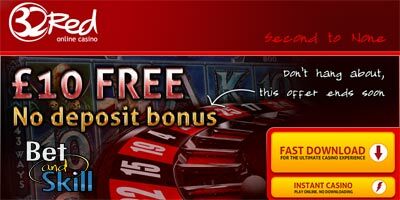 Find here how to get your 32Red casino no deposit bonus! 2. Click here and Register an account online, choose either Download or Instant Play, or use your mobile device and register using their Mobile Casino app. 3. When you log in for the first time, you will be presented with 32Red automated bonus claim system, simply follow the steps to claim your bonus in less than a minute. That's it - you can now enjoy over 500 casino games without making a deposit! New accounts only. Max. withdrawal £100. 50x wagering, game contributions vary, max. stake applies. Full T&Cs apply. 18+ GambleAware. Don't forget your fantastic 320% bonus on your first deposit! You will receive £32 for every £10 you deposit! In total you can claim up to an additional £160 free when you make your first casino deposit - that's up to £170 free when you join! Please note: While the £10 No Deposit Bonus is in play, the maximum bet size in the casino will be reduced. 32Red usual larger limits will be reinstated when you make your first purchase. This promotion is only available to new cash accounts registered at the casino through betandskill.com. The bonus awarded will be credited to a player's Bonus Balance and is subject to our bonus terms and play through requirements before being withdrawn. Different games contribute different amounts to the playthrough requirements. 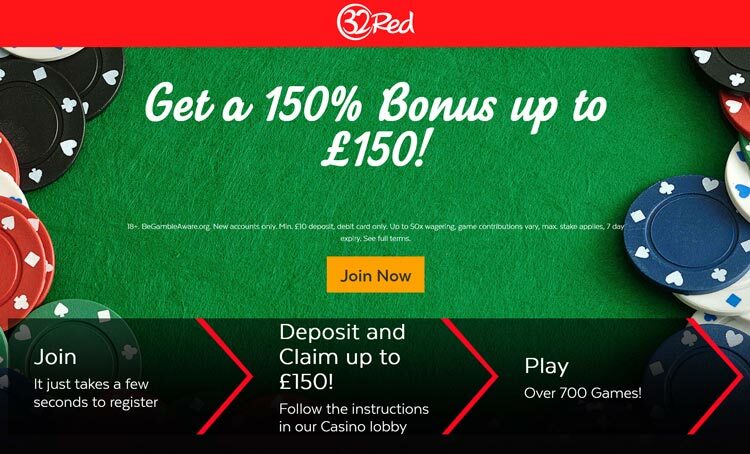 "32Red Casino: £10 Free - No Deposit Bonus - UK only"